Hey Nathaniel. Thanks for taking the time out to talk to me about your new film, ‘Night Of The Living 3D Dead’. It’s a zombie horror which is staying true to the original story but being updated for modern audiences. It is more than just mindless killing of zombies/humans, but of course that features too. I play the lead Ben, he’s been forced into this house with a group of strangers. He’s taken Barbara under his wing as she’s alone and isolated. He’s not really a born hero, he just has common sense and a family to find and get back too. 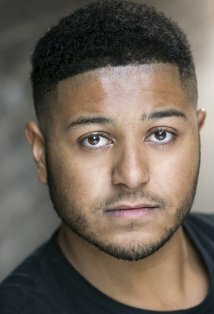 I found the casting online and immediately related to the character. When I found out the magnitude of people applying for this role – (over 5000) I thought ah well nothing ventured and all that. So when I got called for an audition and was finally offered the role I was somersaulting around the living room…metaphorically. I mean I don’t have a living room which could accommodate my cumbersome self cartwheeling away. When the first film came out Ben “The Hero” was played by a black actor, which was relatively unheard of at the time. So big boots to fill which I hope I do justice, but I do have size 13 feet so that should help. What I did like is that the film’s about the relationship between a group of strangers who are forced into a life and death situation, and their opposing actions and agendas colliding. The film stars Gemma Atkinson, your good self, Gregory Caine, Joel Berg, Hannah May Wood, Rachel Doherty and Lara Duke – with Samuel Victor onboard as director – what was it like working with the cast and crew on-set? Any good anecdotes? It was ridiculous; that many different, loud personalities fighting over biscuits and tea, could have shot a film entirely on the outtakes…which subsequently Sam did. I am fascinated by accents so having Irish, Northern, Australian, Canadian plus everyone speaking American…cracking time. Add weapons to a set, instant fun, we all descended into 5 year olds. Quite a bit of laughter for a zombie film, and we all ripped each other so great atmosphere. Let’s talk a bit about you Nathaniel. What made you want to get into the industry in the first place? That’s a question, I know it’s cliché but it’s something that I have always done and wanted. I think what cemented it for me was when I performed a play called ‘Chatroom’ and had my first fans after the show, their reaction made me think I can do this. Ahh jeeze Louise, I think a few golden rules, seriously find out if it’s right for you, if it is than amazing. Just get out there and do it, anywhere, everywhere meet new people. Constantly network and never mistreat anyone in this industry as what goes around really does come around. Even though it seems a big industry word travels quickly and one good thing can catapult you, while one bad thing and you’ll be behind square 1. But passion is so important, never give up, cause if you always stay positive your already ahead of 50% of potential competition. I have a right mash-up at the moment, got some of Kanye’s new album, bit of Fun, Bach, Al Green and Mr Frank Ocean love that guy! First thing is a radio, as I hate my voice at the best of times – so only inner monologue for god knows how long, I’d top myself. Secondly a fishing rod, I never went fishing as a child, seemed too slow for my pace of life so absolutely no idea how to fashion one out of palm and bamboo, plus boys gotta eat! Lastly rum, can’t really enjoy all a desert island has to offer unless you have good rum. Well I’ve just finished filming on two films which are released next year and the year after, another one I’m filming now ‘Fallen Angels’ which is supported by Sir Ian Mckellen. Film called ‘A Mile In His Soul’ which features a great international cast will be filming soon and hopefully next year will be jam-packed with more projects as I love being busy! Previous Katie Elizabeth Garner – (Piranha 3DD – 2012). Next Aaron Ball – (The Ghastly Love Of Johnny X – 2012).